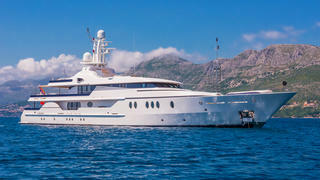 The 52 metre motor yacht Deja Too, listed for sale by Georges Bourgoignie and Andrew Bond at Fraser, has been sold with Nauta Yachts introducing the buyer. Designed inside and out by Terence Disdale Design, she was built in steel and aluminium by Dutch yard Amels to Lloyd's class and delivered in 2003. Her voluminous interior accommodates 12 guests in six cabins including a full-beam master suite on the main deck. On the lower deck are two doubles that can be converted to a large VIP suite, while there are a further two doubles and a twin, all with entertainment centres, television screens and en-suite bathroom facilities. In addition, there are quarters for 13 crew. The expansive main-deck saloon has comfortable seating on cream-coloured settees, a bar, fridge and entertainment centre including a 65-inch flat screen television. Forward is a formal dining area with seating for 12 guests and storage for the Versace dinner service. Up in the skylounge is ample seating, picture windows offering panoramic views and a bar, ideal for relaxation after a long day on the water toys. The upper aft deck has al fresco dining for 12 guests on built-in upholstered seating. Perhaps the most popular area on board is the massive sundeck, offering a fridge, ice maker, barbecue grill and a Jacuzzi. At night this area can be converted into a dance floor. Twin 1,200hp Cummins diesel engines give her a range of 5,500 nautical miles and she is fitted with Quantum zero-speed stabilisers. Lying in Viareggio, Italy, Deja Too was asking €23,900,000.